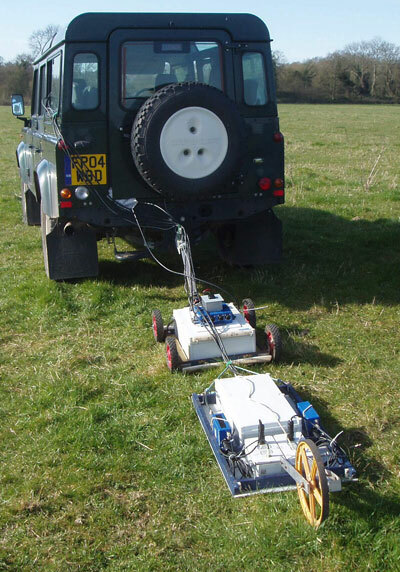 Although resistivity and magnetometry are the most common geophysical techniques applied to archaeological sites, GPR has an important role to play. It is the only geophysical method useful when the ground surface is tarmac, concrete or other built materials but it can also be used to advantage in understanding landscapes, buildings and in wetland archaeology. Potentially the technique has immense versatility because of the wide range of what can be done and also because the creation of a 3-d data block means that the data can be examined horizontally as well as vertically. It is really important to understand which frequency of antenna you need to use and why. If in doubt, get in touch, we are always happy to advise. The basic vertical data is visible in real time during the survey. We will teach you how to optimise the set up. However, even if you get this wrong – provided that you get the correct depth in nanoseconds and a suitable sampling interval, you can change anything you need to after the survey without having to re-do it. Parameters such as gain or background removal are not recorded – they are for presentation only. If you place successive lines parallel to each other & reasonably close together, you can form your data into a 3-d block from which you can extract a series of horizontal (or quasi-horizontal*) better known as time slices. This means that you can differentiate features on the basis of their depths. The Westminster Abbey image below is a time slice. 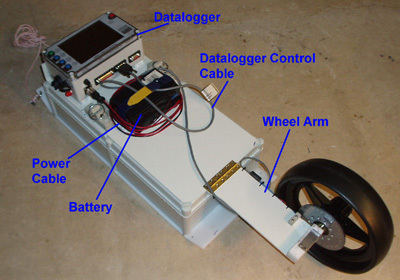 Outdoor investigations usually rely on using a trolley and either a 400MHz or 250MHz antenna. The 250MHz antenna will give better depth penetration, theoretically up to 8m but the 400MHz antenna will give better target definition. Often the difference lies in whether there is any ground water present. For these frequencies you want a Groundvue 3. Most archaeological surveys are fine using single channel but occasionally it is useful either to use several antennas of the same frequency to cover a large area quickly or a mixture of different frequencies to carry out different types of survey simultaneously. If you think you would like to use a multi-channel system, you need either Groundvue 3 multi or the brand new Groundvue 3_8. What is the Equipment like to use? It depends on what is most suitable for the ground surface of your site. The trolley is generally used with two wheels to maintain good ground coupling but can be used with the front wheel down if extra traction is required. All trolleys come with encoder wheels which measure the distance travelled by the radar but you can also use GPS or Total Station. Not only are Groundvues compatible with both GPS and Total Station, using them does not slow down data collection. GPR doesn’t work on my site?! 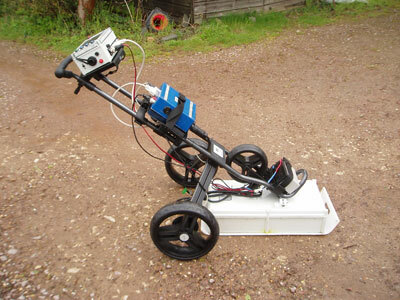 There are a number of reasons why GPR might not work or might appear not to work. It is always possible to identify the reasons. The most common situation where GPR will not work well is in an environment containing a high level of free ions. Typically this could be salt water or some (but not all) wet clays. In this type of environment the transmitted signal passes into the ground as a weak electrical signal. As little or any of the signal is returned to the GPR receiver, most if not all subsurface information is lost. The wrong depth setting. If you set the radar to 10ns and you actually need 100ns, there is no method of recovering the missing 90ns. Not taking account of groundwater or recent heavy rainfall. Water slows down the transmission speed of the radio waves and the effect can be quite marked. It may be that you are not reaching the depth you need to because you are not allowing enough time. Do you want to check this?. The wrong frequency. The classic example here is working on reinforced concrete. You will need a high frequency antenna so that the short wavelengths can pass between the metal reinforcement bars. If the wavelength is longer than the gap between adjacent metal targets, you will not be able to detect what lies beneath the concrete. Note that the use of a higher frequency antenna may limit the depth to which you can survey. A general rule of thumb should be that, if for any reason, a GPR survey does not work, you should identify the reason. Surveys do not fail because “it’s always like this in Warmington-on-Sea”. There is a reason and we need to be careful it isn’t the operator rather than the radar. If you need advice, please contact us. Geophysical Survey in Archaeological Field Evaluation, DM Jones, English Heritage Publishing, 2008. Ground-Penetrating Radar: An Introduction for Archaeologists, LB Conyers & D Goodman, 1997 Alta Mira Press. ISBN0-7619+8927-7 and 0-7619-8928-5. Archaeological Prospection, John Wiley & Sons.